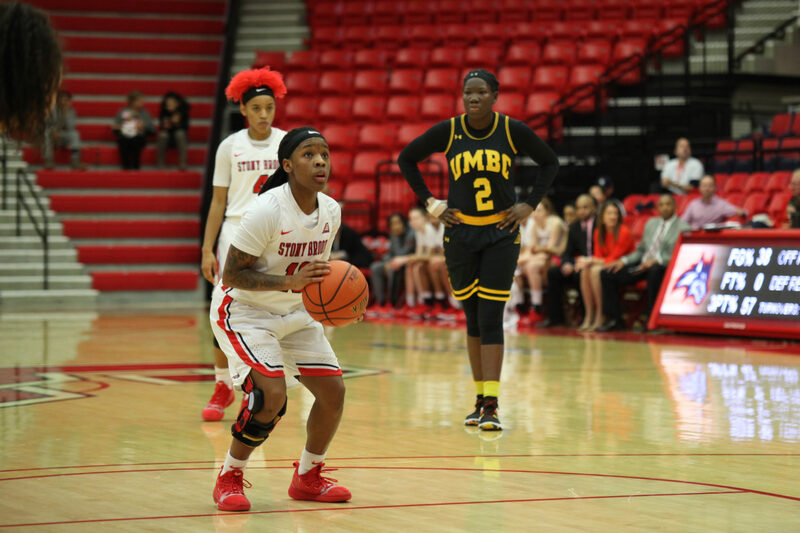 In a victory characterized by efficient offense and an opportunity driven defense, Stony Brook Women’s Basketball came away with the 64-47 win over UMass Lowell on Saturday, Feb. 9. This is their third victory by double digits in their last four games. The Seawolves tallied 17 total assists, nine of which were passed by senior guard Shania “Shorty” Johnson, while the River Hawks finished with seven for the entire game. Stony Brook excelled defensively throughout the contest, grabbing 11 steals and forcing 18 turnovers. Johnson continued showcasing her exceptional passing coming off the victory over Binghamton in which her no look dish to Matthews was featured on SportsCenter’s Top Ten. The guard broke the program’s single-season assist record by recording 185, with six games remaining in the regular season. The senior also reclaimed the top position in NCAA total assists from Oregon junior guard Sabrina Ionescu. Four different Seawolves achieved double digits including senior guard Jerell Matthews, who was the all-around leader for the game, finishing with 17 points, seven rebounds, and four steals. Other prominent scorers included Johnson, who earned 12, and sophomore forwards India Pagan and Oksana Gouchie-Provencher who dropped 10 each. The team excelled in the beginning, only giving up one turnover in the first half and pushing out to a 17-point lead, their largest of the game. Their successful pass-heavy offense and their stifling defense were too much for UMass Lowell to deal with. Despite getting outscored 18-9 in the third quarter, the Seawolves refused surrendering the lead. They followed up scoring runs by the River Hawks with runs of their own in the fourth. The win gives the Seawolves 18 on the season, matching their win total from last season. Stony Brook also remained dominant over UMass Lowell, by winning its last 12 matchups since 2013. After the mid-week bye, Stony Brook will play against New Hampshire at the Island Federal Credit Union Arena on Saturday, Feb. 16.